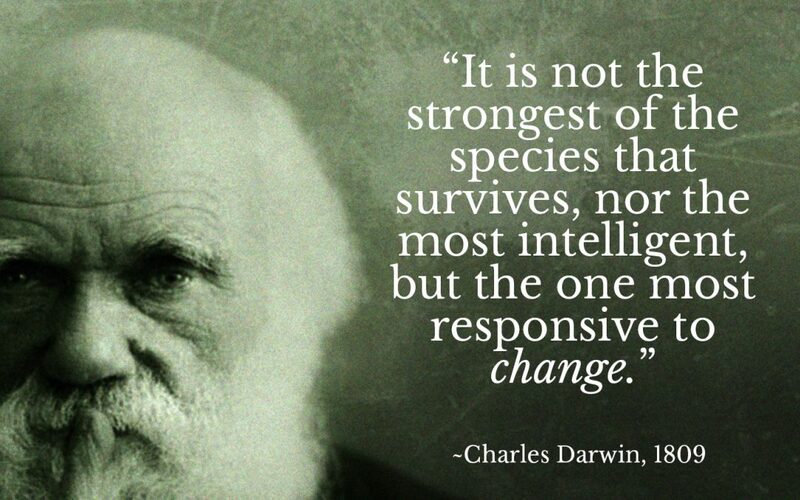 This is a quote from Charles Darwin. He is describing the evolution of species but he could just as well be describing the evolution of businesses. Those businesses that do not change or who change “badly” will disappear (and don’t think this just applies to businesses; Public Sector and the Third Sector are also subject to these laws of evolution). And this the crux of one of the challenges of leadership. Change is necessary in order to survive. People don’t like change. Businesses do not exist in isolation, they exist within a marketplace; competing with other firms, trying to attract new retain customers, working within regulatory structures and dealing with fluctuations in the economy. People’s tastes change, new governments get elected, new products and inventions appear, the cost of materials changes. We know that businesses fail. Many fail because they do not adapt. Coming from Leicester, I can point to Jessop’s as a prime example of a business that failed to adapt, but we can all think of dozens of other examples. A quick look back at the brands of our childhood will give us ample evidence that even the most established of brands disappear if they fail to adapt to the changes. However, there are those that have adapted: Take a look at IBM and where they started from and where they are now, or BT. Brands that have been around for a few years will have had to change. If the first point is that change is inevitable, the second point is that the stimulus for change is always external. I know some people will argue that leaders sometimes instigate changes but they are responding to information … or to gut instincts. Business leaders never instigate change. They make decisions based on their reading of things, when they perceive things are about to change or they perceive an opportunity has risen. However, the challenge for leaders is that most people don’t want change. They want things to remain the same. They thrive when things are stable. People make associations with their status, their colleagues, the ability to master a process, to their desk. That goes for business leaders as well. They become attached to products, to existing methods, to their close advisors. We have a dilemma: Change happens and if you don’t change you will disappear. Yet people dislike change and will bury their heads in the sand rather than accept they have to change …. OR leaders are so busy with their business they forget to scan the horizon for the oncoming tsunami. Change is inevitable. However much we try and avoid it, however much we want to hold onto things, change happens. As a leader, your job is to make sure it is the “right” change and that the change improves your team. The most successful leaders are those that know the direction to take AND who carry everyone along with them. My advice? Take time to scan the horizon, talk to experts, stay hungry and agile. Even better, work out ways to create a learning organisation that does all this for you.